THIS ITEM IS DISCONTINUED. PLEASE TAKE A LOOK AT OUR BALLOON CATEGORY. 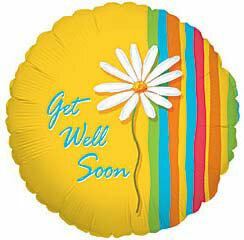 This 9" air-filled Get Well Soon Balloon with a daisy added to your gift basket arrangement will bring lots of cheer! To a speedy recovery! Add one or more balloons.